A new report is warning that the global fashion industry is depleting the world’s water resources, polluting rivers and other surface waters with chemicals and adding to ocean microplastic pollution. The report by the House of Commons Environmental Audit Committee in the UK Parliament says the industry is consuming and polluting huge volumes of water, with fashion items bought in the UK and sourced overseas causing significant environmental and social damage far beyond its shores. In 2016, resource efficiency organisation WRAP estimated that the water footprint of clothes used in the UK alone was 8 billion cubic metres. Globally, the fashion industry consumes an estimated 79 billion cubic metres of fresh water annually. The growing and production of fibres consumes the greatest quantity of water. According to the report, most clothes sold in the UK are produced in Asian countries with low labour costs and weak environmental governance. Recently there has been a growth in garment manufacturing in UK as brands and retailers seek to respond faster to consumer demand. One kilogram of cotton – equivalent to the weight of a shirt and pair of jeans – can take as much as 10,000–20,000 litres of water to produce. The Aral Sea, formerly one of the four largest lakes in the world, has almost entirely dried up, in large part due to intensive industrial cotton farming in Central Asia. Major cotton producing countries such as China and India are already suffering from medium to high levels of water stress in certain areas. An independent report published by the Global Fashion Agenda in collaboration with the Boston Consulting Group The Pulse of Fashion warns that as water scarcity worsens in the future some cotton growing nations ‘may face the dilemma of choosing between cotton production and securing clean drinking water’. 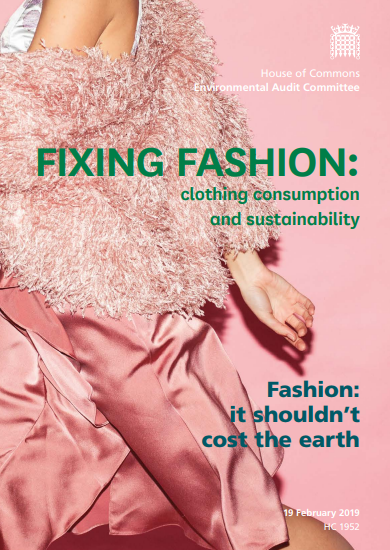 The report concludes that although some parts of the fashion industry are making progress in reducing their carbon and water consumption, the improvements have been outweighed by the increased volumes of clothing being sold. The report is calling for Governments to oblige retailers to ensure full traceability in their supply chains to prove decent livelihoods and sustainably sourced materials. The EAC heard that the environmental price tag for clothes is largely determined during the design and production phase, while the greatest quantity of water is used during the growing and production of fibres. Textile production is responsible for high volumes of water containing hazardous chemicals being discharged into rivers and water courses. Twenty per cent of industrial water pollution globally is attributable to the dyeing and treatment of textiles, according to the Ellen MacArthur Foundation. “Fashion retailers must take responsibility for the clothes they produce. That means asking producers to consider and pay for the end of life process for their products through a new Extended Producer Responsibility (EPR) scheme.